“7th International Congress and Expo on Bioscience and Biotechnology” at Paris, France during September 23-24 2019 which adapted the theme “To solve local and Global Grand Challenges in Bio-Field” The event will have plenary speakers( Dr.Orlando Auciello with H-index of 68), established Keynote speakers, active Invited speakers and fresh contributed speakers. In addition, variety of poster presentations along with workshops and special sessions would be interested in audience including establishing new collaborations. Bioscience-2019 brings you all Leading Academic Scientist, Researchers and research scholars to exchange and share their experiences and research results about all aspects of Bio-field. 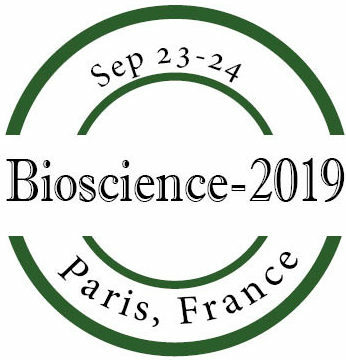 Bioscience-2019 gathers all recent innovations, trends, and concerns, new challenges and the solutions adopted in the Bio-field.